"The excitement is palpable as the number of apps in the Windows Phone 7 marketplace edge towards 5 figures. 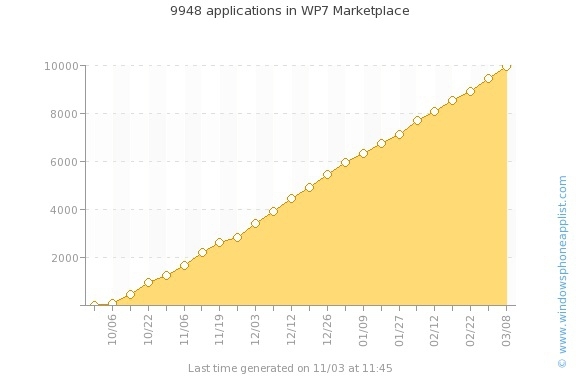 WindowsPhoneapplists.com reports nearly 1200 applications have been added in the last 2 weeks, which is an acceleration on the usual 1000, and should guarantee we pass over the 10,000 mark today." This is quite an accomplishment, and definitely bodes well for the future of Windows Phone. Only 4 1/2 months since it was released to the public, and developers have showered us with great applications faster than we could have imagined. I think the smartphone war is going to heat up significantly over the next year or two. I'm glad that I could do my small part. Last month I published my first app, a game called "Wild Tiles." Yesterday it was ranked #883. For years, I have written various games and applications for Windows desktop and Windows Mobile, on my own time and for my own amusement. I never seriously considered selling them because I thought it would be too difficult. Windows Marketplace really made the process easy for me!! I hope to join you in the boat. But first I need to learn C#. So it may be a while. Watch and learn with this great series from Bob Tabor, on Channel 9. I'm into Day 3, and I'm reallying enjoying it. Ha! I wish they were paying me to learn this stuff. I'm doing it because I like the platform and I hope to make a little extra to help out in these tough times.